Ah, Forbes. They, along with eWeek, CIO Magazine and a whole lot of other sites, have long been in the business of selling links on their site. The links aren’t placed very prominently, but the buyers don’t care because all they want is the search juice. See, for example, the JC Penny paid links story from last weekend. 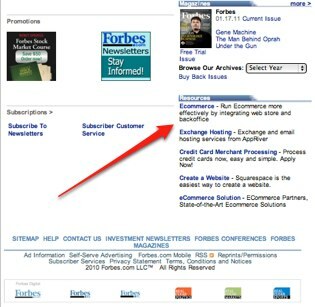 Starting Monday Forbes started to delete the links from their site. We’ve been watching these links come down, but they seem to have forgotten one page. See the bottom right of this page for paid links to Netsuite, AppRiver, Bluepay, SquareSpace and others, all with very nice descriptive keywords like “ecommerce,” “Create a Website,” etc. Previous links to Siemens and AT&T were prevalent, and those links still appear on eWeek and CIO Magazine. Happy to help, Forbes. Next time, try to get rid of all of the evidence before denying everything.